21st – 26th July 2014 at Arecibo Observatory, Puerto Rico. The school provides students with hands-on experience in designing and running experiments at incoherent scatter radar facilities. 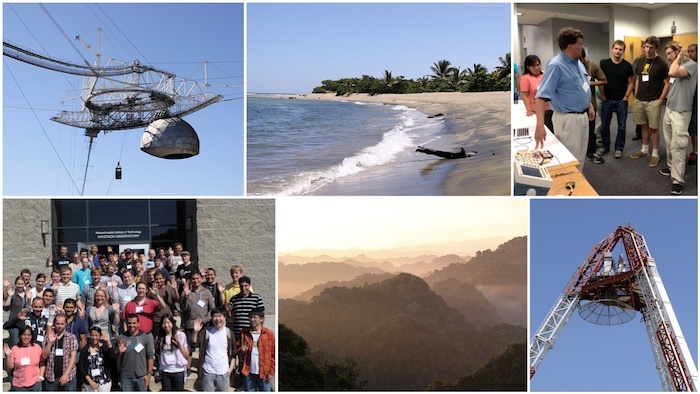 During this summer school, students will have the opportunity to run experiments with the Arecibo incoherent scatter radar (ISR) and use data from multiple ISR observatories, such as EISCAT, Poker Flat (PFISR), Millstone Hill, Resolute Bay (RISR), Sondrestrom, and Jicamarca. The school will be structured to provide presentations in the morning and hands-on experience in experiment design and analysis in the afternoon. The morning lectures will include an introduction to the theory of incoherent scatter, radar operations, ISR analysis techniques, and the Madrigal database. The afternoon exercises will involve working closely with ISR facility staff in the topic areas of proposal design, experiment execution, and data analysis. All students will have the opportunity to work one-on-one with experienced scientists from multiple institutions. The ISR summer school is suitable for graduate and advanced undergraduate students and attendance is limited, and the deadline for application is 3rd March 2014. If you apply through the EISCAT side, please note the page on Location and Travel Advise. We are looking forward to welcoming you at the Radar School! If you have any questions, contact us using the details given in the respective web pages. Dad sends his kids to space!